The UniCoin Blockchain offering is now closed and is no longer accepting investments. UniCoin Blockchain is building a new kind of crypto mining ecosystem with the potential to render the centralized datacenter obsolete. At the center is the MINT, an elegant piece of solid-state technology that's capable of more efficiently mining cryptocurrency than the servers stacked high in data centers around the world. But, the MINT is more than itself, as each MINT represents one piece in what can become a worldwide decentralized data center. We're adopting a novel micro-leasing approach when it comes to creating a sustainable and profitable mining model. Instead of building centralized data centers, UniCoin's MINTs are deployed in small, fractional spaces inside underutilized buildings. If you invest you are betting the company’s future value will exceed $10M. The solid-state nature of the MINT keeps heat generation to a minimum, and because the entire mining network is decentralized so too is heat generation decentralized across the entire network. This, of course, eliminates one of the biggest infrastructure concerns of an old-school centralized data center: cooling. It's not just heat generation that's decentralized; it's also power consumption. The mining of cryptocurrency is beginning to strain grids around the world. Our proposed MINTs are designed to consume less power than their equivalent in traditional mining technologies, and the decentralized nature of our mining network means that power consumption is spread out. All of this leads to a business model that is a perfect combination of sustainability, adoptability and scalability. Our initial network of MINTs promises tangible environmental benefits, turns unused space into a revenue source, and easily scales due to its decentralized nature. If you want to be a part of the future of crypto mining and blockchain processing, then invest in UniCoin today! 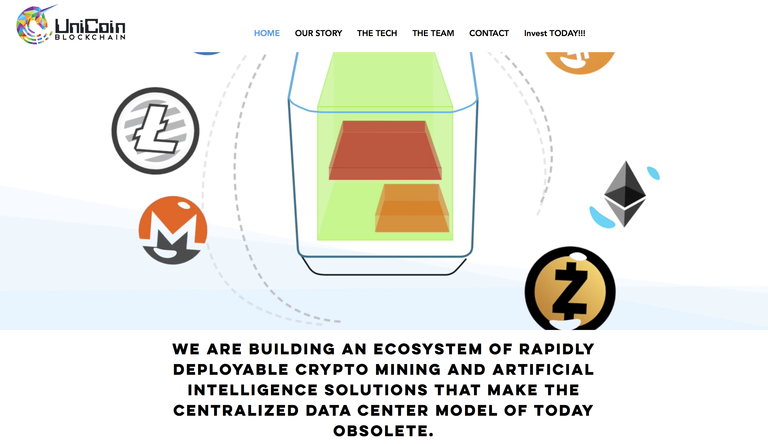 We are building an ecosystem of rapidly deployable crypto mining and artificial intelligence solutions that make the centralized data center model of today obsolete. Blockchain's powers of transparency, security and decentralization offer immediate solutions to obstacles long encountered by countless other industries. However, while the sky may be the limit when it comes to the evolution of this technology, blockchain's potential and realized applications are creating new obstacles and problems all their own. 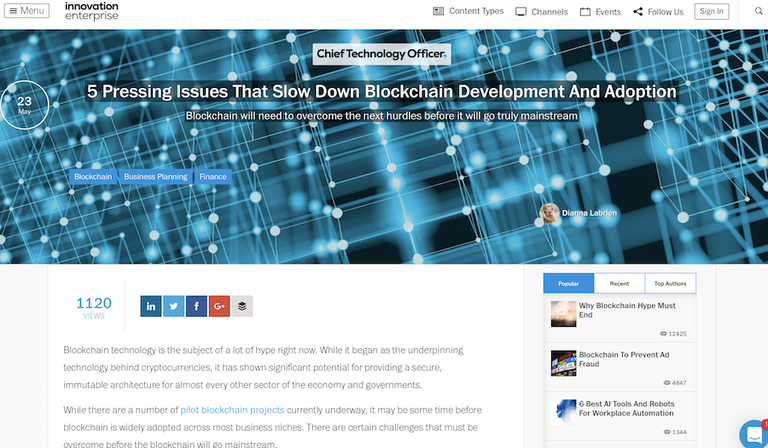 While blockchain technologies have been quick to evolve, the infrastructure that supports this evolution has been slow to adapt. With new coins being minted every day, the challenges and obstacles faced by our outdated energy infrastructure multiply. In our opinion, much of today’s public and private blockchain hashing solutions is rooted in 1980s data center thinking. These capital-intensive solutions involve large buildings, immense power and enterprise-level cooling infrastructure. This model taxes the grid, invokes demand fees, and ineffectively manages thermal loads. At UniCoin, we've developed a solution that's far less capital intensive and far more efficient. At the core of our decentralized model for mining crypto is the MINT, a solid-state piece of technology that offers numerous benefits over traditional mining technology. In essence, the MINT is without moving parts and has a proprietary fluid cooling system, which conspire to increase efficiency and also to decrease heat output. Because of this, MINTs can be deployed in any of the spaces already outlined above without contributing to infrastructure headaches. Takes up an imperceptible amount of space. Costs a fraction of a tradition mining facility build out. Hashes more blockchain or AI demands per square foot than existing technology. Invigorates high-tech economic development in rural USA leveraging federal credits for job creation. These benefits, we believe, should aid in the rapid expansion of our decentralized network and in UniCoin's ability to deliver a comprehensive solution to the problems currently presented by blockchain technology's rapid expansion. The MINT is currently in final development stages and will not be deployed until Q2 of 2018. We have tested the internal components of this MINT to determine its projected overall performance metrics. The MINT can be powered up in a matter of minutes, not hours and it begins mining immediately. Our proprietary cooling system allows the MINT to run in almost any kind of environment. With no fans or moving parts, the risk of the MINT breaking down (compared to traditional mining machines) is very low. The MINT's compact design means that it can be installed almost anywhere there is an extra 10sq ft of space. Our technology uses 60% less power, making it the most environmentally friendly way to process blockchain transactions. Our decentralized network requires half the capital necessary for building a similarly powerful network the traditional way. One MINT can reside in a space that's less than 10 sq. ft., meaning our technology uses 50% less space than traditional mining tech. Our technology derives its inspiration from deep-space probes. That means it's built to last and incredibly reliable. Our distributed clusters typically yield 40% more hashing per watt than traditional means and with a much higher level of security. For property owners looking for a passive way to generate revenue, the MINT is a no brainer. We simply place our machine in their space and literally mint digital currency, of which the property owner receives a percentage. Our mining partners profit from their unused space and power and UniCoin builds its revenue stream with every location it adds. Across the entire decentralized network, though, a significant amount of cryptocurrency is mined. The portion that goes to UniCoin itself will be put to use in a number of different ways, all aimed at solidifying our long-term position. In only a few short years, the idea of wanton energy consumption has become associated with the blockchain. In fact, state like New York are even moving to impose tariffs on individuals and entities that are participating in crypto-mining. The team behind UniCoin and the MINT is a pair of entrepreneurs who have extraordinary experience turning bold ideas into realities. Steve Fambro and Chris Anthony previously worked together creating the world's most efficient commuter car, which was capable of achieving 300 miles per gallon. Working independently, both of Unicoin's founders have accomplished a great deal in their own rights. Chris successfully built his own lithium battery company which he took public and build his boat company from scratch into one of the top sports-boat manufacturers in the world. Steve led the construction and operation of the largest advanced hydroponics farm in the world and ran the CleanTech Investment fund for the royal family of Abu Dhabi. Invest in UniCoin Blockchain Today! By applying the underlying principles of the blockchain to the infrastructure that supports it, UniCoin has devised an elegant solution to the growing pains of a burgeoning industry. Even more, we've developed a business model that can sustain and scale, all while offering a win-win situation for property and business owners, which has the potential to generate a high rate of adoptability and profitability. We believe that blockchain offers a path forward for society, and we believe that UniCoin has developed the backbone upon which this technology can expand. If you're excited about the future potential of decentralized, secure, stable blockchain solutions to age-old problems, then invest in UniCoin today! Unicoin BlockChain, Inc. will offer 10% additional bonus shares for all investments that are committed by StartEngine Crowdfunding Inc. shareholders (with ≥ $1,000 invested in the StartEngine Reg A+ campaign) within 24 hours of this offering going live. StartEngine shareholders who have invested $1,000+ in the StartEngine Reg A+ campaign will receive a 10% bonus on this offering within a 24-hour window of their campaign launch date. This means you will receive a bonus for any shares you purchase. For example, if you buy 10 shares of Class B Non-Voting Common Stock at $10 / share, you will receive 1 Class B Non-Voting Common Stock bonus shares, meaning you'll own 11 shares for $100. Fractional shares will not be distributed and share bonuses will be determined by rounding down to the nearest whole share. A LOT development progress, a new name, and a new chance to invest!!! It has been a couple of months since our last update and we’ve been making great progress in building and testing out Beta parts, assemblies, and software. It’s been exciting to see things come together from CAD models and simulations to actual parts you can touch! We’ve learned a LOT from our efforts and made some great strategic connections over the last few months. And our team has grown to double its size with 14 people now working with us to bring eco-friendly computing to life. And with market conditions evolving and our first revenue partners lining up we’ve made a BIG decision! We are changing our name to UniData Tech Inc. from UniCoin Blockchain Inc to reflect our shift in focus from cryptocurrencies to the larger and more lucrative field of Big Computing. A field with new applications for Bioinformatics, Artificial Intelligence, and Deep Learning springing up every day and a voracious demand for energy and space. 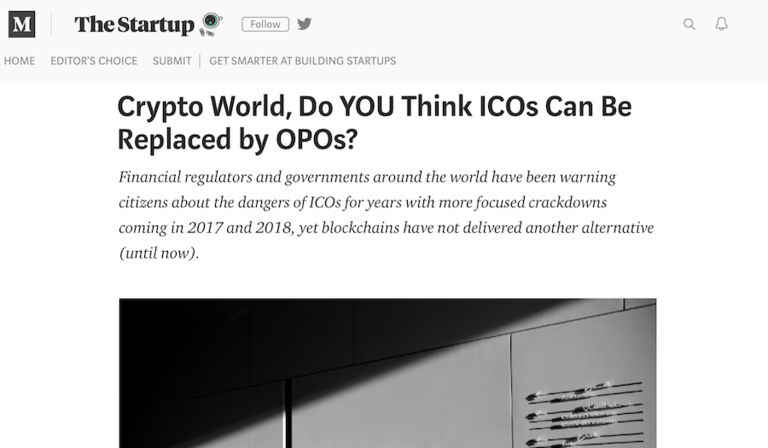 There are several reasons for this, from the changes in the cryptocurrency space to social media platforms banning any companies that deal with crypto. But mostly it relates to the technologies that we are creating for Cleaner I.T. Our platform of hardware and ecosystem of distributed I.T. fits well with the needs of Big Computing, so focusing on this new space is a better use of our technology and competitive advantage than cryptocurrencies and blockchain is. So we are pushing forward with a new name and a new focus on Clean I.T. for Bioinformatics, Artificial Intelligence, and Deep Learning applications. We are also launching another StartEngine campaign to give those who missed out on the last round the opportunity to support our new I.T.’s eco-system as a more capable, profitable, and eco-friendly solution for Big Computing. For those of you that have already invested this may be a great way for you to increase your ownership in us. Or you can just follow this new campaign to get our detailed updates. And for those that haven’t invested, you can read up on our next generation developments and chose if an investment is right for you. We also have new social media pages to go with our new name so please follow and share! Alongside email updates, our channels are one of the best ways that we can keep you up to date long-term and find like-minded people who might be interested in our story. Thanks for ALL your support! We hope you will follow us into 2019 and a new way of thinking about Clean I.T.! Thanks for ALL the support!!! And stay tuned for updates! Our 1st campaign is closed! We can't thank everyone enough for their support. Your investments, sharing with friends, comments, and connections have REALLY helped us to advance our efforts toward more eco-friendly and profitable advanced data processing. The process to fully close this round and accept all new investment will take a few weeks. So please be patient if you are a new investor. After that point, we will have a list of all of our new investors to send our updates to. But we will continue to update all the followers of this first campaign in the meantime. There is some exciting news coming in the next few weeks, so please stay tuned. And again, thank you all for the support! The IT industry needs more advanced and environmentally friendly solutions as it continues to grow in its impact on our planet. You are helping to make that happen! Only a few hours left to invest in UniCoin, the future of eco friendly advanced data processing!!! The world is shifting rapidly to one that needs more and more processing power for everything from Artificial Intelligence to DNA Analysis, Cancer Research, and Crypto Processing. It seems that everything new in the data space requires a LOT more processing power to crunch. Amazon, Google, and Microsoft are spending BILLIONS to build out capacity to meet this need with HUGE Datacenter projects that are inefficient and wasteful. UniCoin takes a distributed IT approach to meeting our world's future processing needs. One that is easily scalable, more efficient, more eco-friendly, and MUCH more profitable. We appreciate everyone's support through our campaign! Please take a look at investing if you haven't and if you have please share our campaign link(https://www.startengine.com/unicoin-blockchain) with your friends on Social Media if you can. We are looking to close this campaign strong while working internally to finish up our first MINTs to start field testing in the coming weeks. Exciting times are ahead for UniCoin!!! Stack #2 getting WET! Campaign closing SOON! And Amazon NEEDS to partner with UniCoin!!! THANKS for ALL the support! We now have over 400 investors supporting our vision for more eco-friendly and efficient data processing!!! Please note: there are only a few more days left in this campaign and the opportunity to invest at this valuation level will vanish soon. Please let anyone that might be interested know their window is closing! Also, below is an interesting article: These are REAL problems that communities are facing as BIG Data expands. 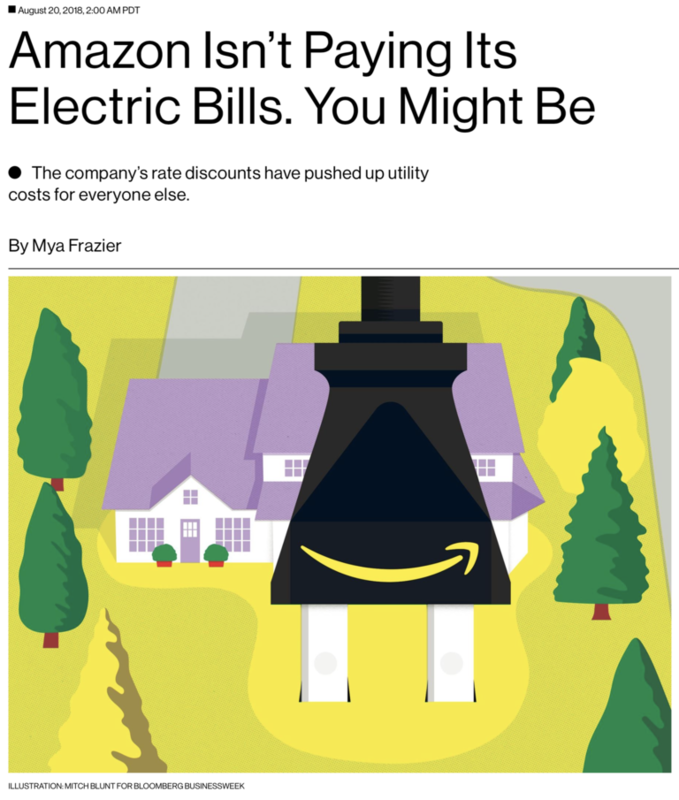 We believe Amazon would look SOOO much better here if they were to partner with UniCoin on Distributed IT versus these inefficient, costly, and divisive build-outs! Our MINTs provide income to property owners, create more jobs, and are MUCH more efficient and better for the environment!!! And Amazon isn't alone, BIG Data companies spent over $20B in 2017 for Data Center build-outs and that number is accelerating FAST! UniCoin can be a significant player in this space with our simply smarter approach to expansion. This IS an EXCITING time and market for us!!! Testing of internal MINT assemblies has begun. And there are only a few more days left to invest!!! 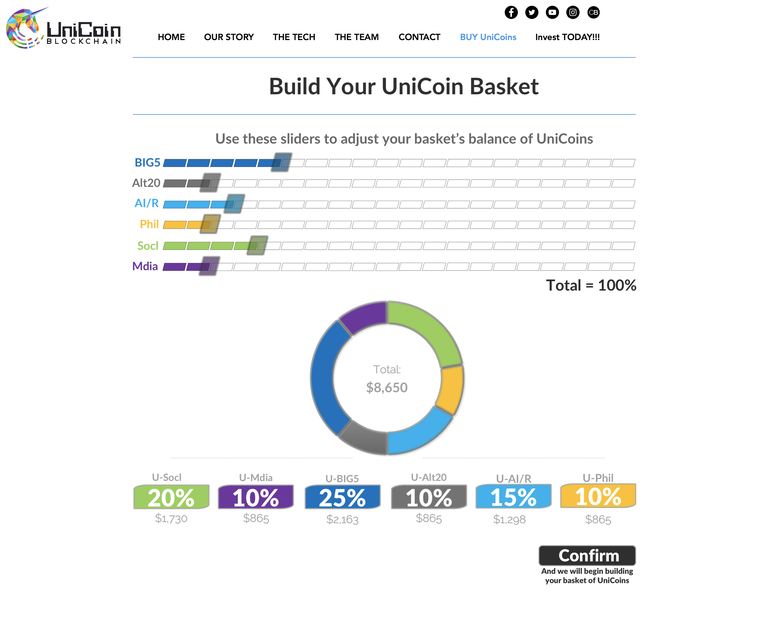 As you might know, UniCoin Blockchain has exceeded its minimum funding goal. When a company reaches its minimum on StartEngine, it's about to begin withdrawing funds. If you invested in UniCoin Blockchain be on the lookout for an email that describes more about the disbursement process. Want to see how UniCoin can help build over 400 new schools from the data center waste it helps save??? Well, just looking at one company's data center business for comparison, UniCoin provide: Millions of homes worth of power, whole cities water needs, thousands of miles of new sidewalks, hundreds of new schools and take almost a million tons of CO2 taken out of our air! ALL for FREE and all because of UniCoin's distributed IT infrastructure approach! Not to mention, it's a WAY more profitable way to business!!! Unicoin Blockchain is extending their offering for 60 days. The World’s First Alt Coin Crypto Index Fund Has Arrived! We are happy to announce the world’s first platform where investors can build their own personalized basket of cryptocurrency index funds based on their interests. Building upon our distributed network of MINT processing power and capitalizing on the demand for ETFs among younger generations, we are launching the world’s first platform on which investors can build their own portfolio of alt coin index funds. With 9 out of every 10 millennials investors agreeing that ETFs are vital to every investment strategy, we are now bringing this same popular investment vehicle into the world of crypto. We are introducing several new Indexed funds to make it easy to invest in diverse crypto holdings based on one’s desired market cap or interest area without having to open several wallets or work with different exchanges. It’s simple for the investor; our funds do the legwork for investors to access areas of crypto that are difficult and expensive to acquire and hold. Investors will be able to access our indexed coins on a number of exchanges, or through our www.UniCoin.life portal where they can easily build a basket of their choosing. These funds allow investors easy and affordable access to a whole new world of diversified crypto holdings. For the first time ever, investors will be able to invest in all of the top coins by the market cap category of their choosing and build their own basket of coin indexes based on their individual investment goals and personal preferences. Coins created for indexes of media, philanthropic, research and social media coins, will be a valuable tool for investors that are looking for diversity in one particular industry or interest group. Using these indexed funds can help people to not only invest in the space but also to support causes they feel strongly about. And we will continually add to our indexed coin offerings as demand dictates. We believe that people need simple alternatives when investing in the Crypto space. It is still very hard to own many sectors of the crypto world and trying to manage and monitor more than just a few different crypto holdings can become a nightmare. With our simple and inexpensive indexed funds, investors will be able to access difficult-to-own assets and monitor their performance easily. This even gives people the opportunity to focus on areas they care about like media assets, AI, or charities they’d like to support. This is a whole new way to own crypto and it will be accessible to anyone with interest in this space. We have already created software and hardware innovations which could render the old-centralized datacenter obsolete. These radical new technologies will be used as the processing backbone for these new indexed coin funds. Our MINT supercomputers will begin rolling out in the next few weeks as the base for our worldwide network of processing power for Crypto, A.I. and advanced data processing of many kinds. This new indexed fund platform allows us to manage our proceeds from diverse crypto mining and processing and also gives investors a convenient way to diversify their crypto holdings. A full White Paper on our new Indexed Fund Platform will be posted later this month for review here and on BitcoinTalk, Reddit, and Github. It will discuss, in much more detail, the structure, function, and timing of this innovative new platform. We hope you are as excited as we are about this new platform as it is one more tool for us in our efforts to make the world of Advanced Data Processing more efficient, environmentally friendly, and profitable! Please share our story with friends and like us on Facebook www.facebook.com/UniCoinBlockchain to stay up to date on all our progress! A small part of our BIG future! Every innovation has to start somewhere. And, for our MINTs, it starts here with part number "MV1-SBSU-00". This was our first released part for the newly designed UniCoin MINT and it is currently on order from our vendor. It is a key support for our processor unit assemblies inside the fluid chamber of the MINT. A small and simple part but it's the beginning! And we are very excited to have finalized our Computational Fluid Dynamics simulations for the fluid chamber so we can move on to approving production parts for release and build. We hope to release most of the fluid chamber parts this week and the case and substructure parts over the next few weeks. It is shaping up to be a BUSY summer for UniCoin but one filled with the promise of more environmentally friendly and profitable data processing and extra revenue for property owners everywhere! Please tell your friends about us and like our Facebook page to see more minor updates and info. We already have over 300 investors and are adding new supporters every day! Thanks for all the LOVE! What does UniCoin’s new distributed supercomputer, the ‘MINT’ have in common with spacecraft, race cars and biomedical devices? They all use Computational Fluid Dynamics(CFD) in their design and to optimize their performance. But why would a supercomputer company need CFD? You see, UniCoin is working to displacing large, power hungry and wasteful datacenters altogether while simultaneously helping local business owners, the grid, and the environment. We’re doing this with our new kind of distributed supercomputer, the MINT which is ultra-compact and doesn’t need fans or external cooling. CFD is a tool that shows us how well that it’s all working, and we’re happy to report; it’s working awesomely! The CFD flow lines and temperatures around our processors are amazing and pretty to see! But more than that, they are within one percent of the actuals we’ve recently measured with our thermal imaging camera when testing our real-life processors in service. We can’t show you everything… but we’ll give you a little peek behind the curtain. 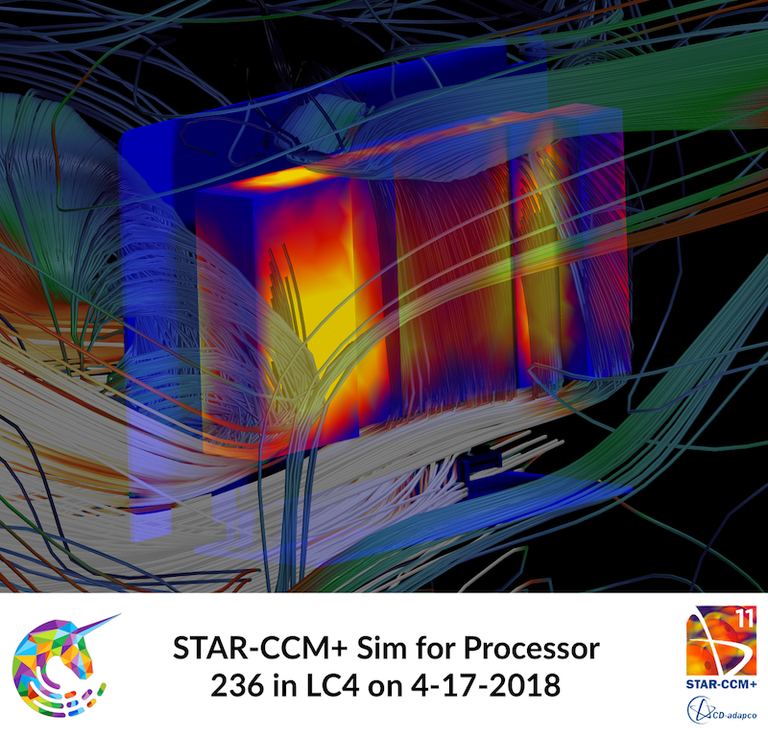 The first pics show our CFD analysis using a very advanced program called Star CCM+ by CD Adapco, which we consider to be the best software for this kind of analysis in the industry. There are also two pics from our new FLIR Thermal Imaging camera with one card, the hotter one, in an air-cooled environment and the other in our proprietary liquid cooled system. Both cards are running under the same load but the one in our innovative liquid cooling system has much less temperature variance across the card and is significantly cooler at the processing chip. Most importantly what these pictures are illustrating is a very close correlation between what our CFD simulations are telling us versus what is happening in our actual test rigs. It is VERY exciting for us to see less than a one percent temperature variance between the two! Keep in mind; UniCoin builds, owns and deploys its MINTs which generate revenue from services like AI processing and cryptocurrency hashing. The MINT does all of this much more efficiently and for less capital than the big guys, like Amazon AWS and Microsoft Azure. A BIG part our story is CFD and the optimal efficiency it helps us attain, which is why we’re sharing it with you. UniCoin’s lab is humming with different test rigs running continuously and MINT pre-production parts prepping to be released very soon. We’re stoked to be getting great new data every day which confirms our mission to make the IT industry more environmentally friendly and more capable of handling tomorrow’s processing needs! Thanks to everyone who has invested thus far and to all those who are helping us spread the word about eco-friendly distributed supercomputing. PLEASE add us on Facebook as it is the easiest way for us to spread our message and it’s also a great way to see more minor updates and info from us! We have a website AND social media to share! PLEASE, add us and tell your friends! Its been a busy start to our campaign, and with so much feedback, we want to give people an easier way to learn more about us and to keep up to date on more than just our Start Engine Updates. So we've launched a website and some social media. Have a look at the new www.UniCoin.life and our Facebook at www.facebook.com/UniCoinBlockchain The website is basically a rehash of our Start Engine campaign for now but we will continually add information to make it more useful. And our Facebook is where we plan to have regular updates that may be too small for Start Engine but are great and sometimes FUN information for you and other interested investors. PLEASE, Please, please add us on your Facebook and PLEASE tell your friends. 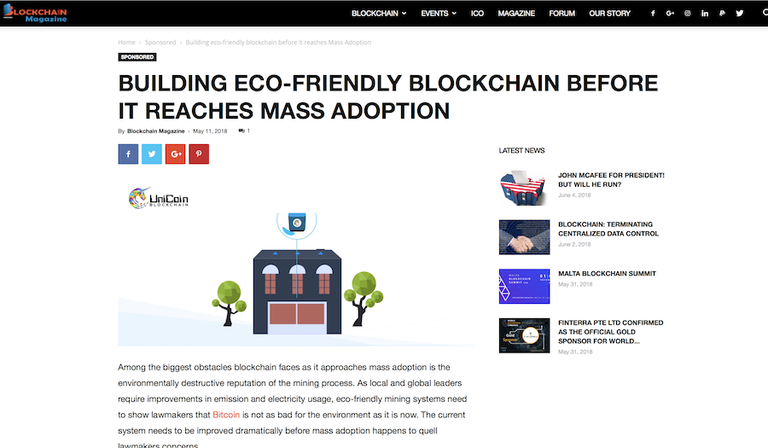 We are building a wonderful community of those supportive of more eco-friendly and profitable blockchain processing. And with your help, we can grow it bigger and faster!!! UniCoin Blockchain, Inc. has updated the Team, Valuation, and Risks section of their Offering Document. Our first week of fundraising has been AMAZING with over 200 investors from about a dozen different countries supporting us! We’d like to say Thank You for all the support and answer some of the common questions we’ve received over the last few days. When will your first MINTs be operational? We are currently finalizing our first CAD models in parallel with creating Computation Flow Dynamics models to optimize our fluid cooling systems. We anticipate 3 to 4 more weeks of this work before we are comfortable enough with the design to send it off to our vendors to build parts for our first MINT prototypes. What is the MINTs hash rate? The MINT is a block of processing power that can include many different hardware, firmware, and software combinations. We plan to optimize the MINT for many different revenue generating tasks of which only one is traditional Crypto Currency Mining which involves “Hash Rates”. These “Hash Rates” can vary wildly with the complexity of their given algorithm and the difficulty of the blocks they are solving for at a specific time. It is simply impossible for us to state a certain “Hash Rate” without specifying all of those metrics and the date at which they were compiled. What type of different hardware, firmware, and software are you using? As mentioned above “The MINT is a block of processing power that can include many different hardware, firmware, and software combinations.” We have been trialing many different combinations of each to see what the best revenue yield could be once we apply these hardware, firmware and software solutions to our MINT. Once we are able to begin production of our MINTs as a field-deployable unit we will choose what best suits the processing needs we see at that time. We will also be developing several of our own proprietary processing tools for the MINT which could include any or all of the hardware, firmware, and software that the MINT will utilize in the future. For now, though, our focus is mainly on the MINTs architecture and initial deployment and not on proprietary hardware, firmware and software designs. How does the MINTs solid state fanless cooling work? 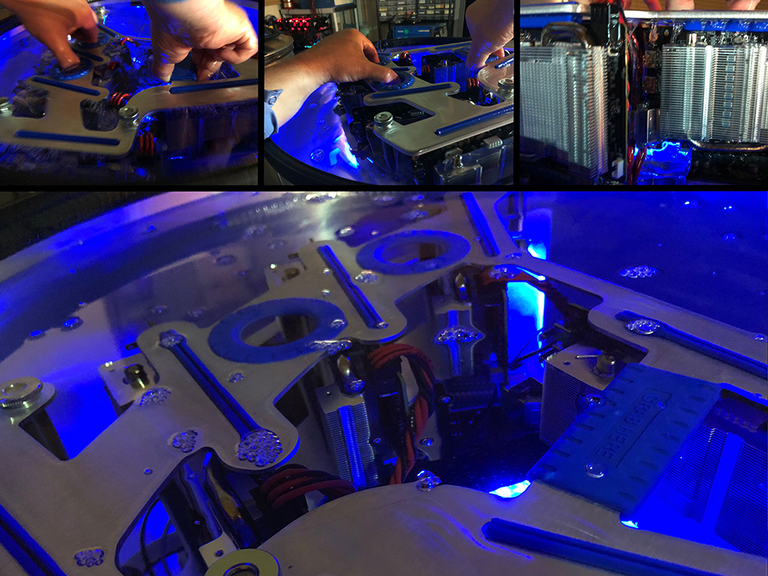 We have a working fluid in the MINT that we use to cool all of the solid state components inside with a proprietary flow system. This distributes the heat evenly inside the unit and amongst the working fluid. That fluid dissipates its heat through the MINT’s case via convective air currents through and around the MINTs case. In this way, we can remove the heat without having internal system fans or fans in the MINT at all. This is in an effort to make the MINT as robust and maintenance free as possible. How much energy does your MINT use? This is very dependent on the internal hardware to the MINT, but we are trying to make the MINT a very easily deployable unit. So each one will roughly use between 8 and 10KW of power. This can typically be supplied via a 220v 50a plug or the unit can be hardwired into a building’s electrical system. What kind of testing have you done to show that your MINT can perform better than traditional hardware? 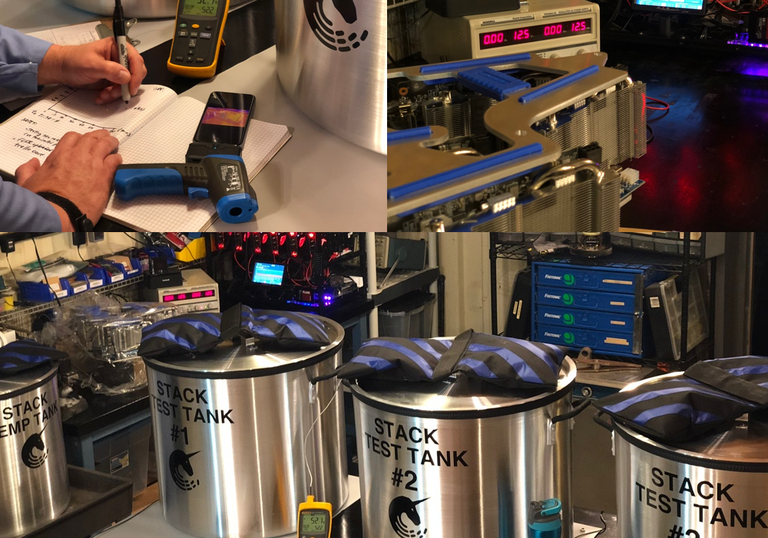 We have been testing traditional hardware for several months now and have logged roughly 60,000 hours of data on our processing units and over 40,000 hours of specific chip and system energy consumption data. By comparing that data to that of well understood and researched fluid cooling methods, many of which will be used in a MINT, we have calculated how much energy we would save over traditional HVAC and air-cooled hardware configurations. This has shown us not only that the MINT could drastically outperform traditional air-cooled hardware but, because this is a distributed system with no need for active cooling, almost 100% of a traditional data centers cooling needs are abated. And cooling can be up to 30% of a data centers energy usage. This means the average MINT will have a huge performance advantage over traditional air-cooled hardware in a large data center type environment. How will you pay for the space you use in buildings? Each MINT can generate revenue by processing Blockchain/CryptoCurrency, AI, Big Data, Deep Learning, and many other information needs. All of these processes would be paid for by those requesting them or via their yield CryptoCurrency. These revenues will be shared with the property owners that host our MINTs to compensate them for their space and power. Each contract may be unique for these micro-space leases but the principal would be the same for all; let property owner gain revenue from their unused space and unallocated power distribution. All of these property owners have an asset in this extra space and power distribution. UniCoin believes they should be able to harness some revenue generation from these unused assets. How many MINTs can go into one building? The optimum number of MINTs we install per building is based on a variety of proprietary assessment factors we’ve developed working with large real-estate management firms and multiple property owners. As such, there is no single answer. In general, though, there is a ‘sweet spot’ for a number of MINTs in a given building such that they do not require any additional HVAC or facility improvements for hosting them. Thank for all these great questions and please feel free to ask more in the comment area at the bottom of this page. If you have any doubts at any time about your investment, please see here for StartEngine’s cancellation process. And, PLEASE tell your friends about our campaign! It’s with YOUR help that we will be able to build the cleaner, more efficient and much more profitable processing solution this world needs!! !